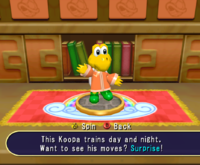 Kung Fu Koopas are Koopa apprentices of Koopa Master in Mario Party 7. 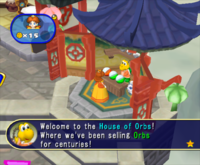 The Kung Fu Koopas live in Pagoda Peak, running the Orb Huts. The player could buy a trophy of a Kung Fu Koopa for five hundred Cruise Mileage Points in the Duty-Free Shop. The Kung Fu Koopa's trophy description states that they "train day and night." Grand Canal • Pagoda Peak • Pyramid Park • Neon Heights • Windmillville • Bowser's Enchanted Inferno! This page was last edited on September 8, 2018, at 15:32.